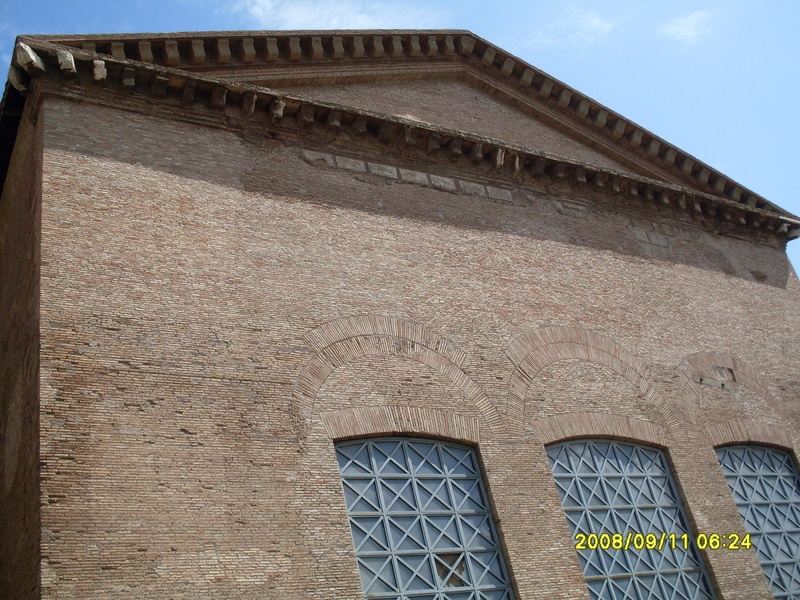 The first time we visited the Forum, the Curia was not open to the public. All the documentaries, and guide books said that it was open, but sadly, we were met by locked doors and caution tape. Perhaps, more than anything else, Frank and I wanted to see what the interior looked like. 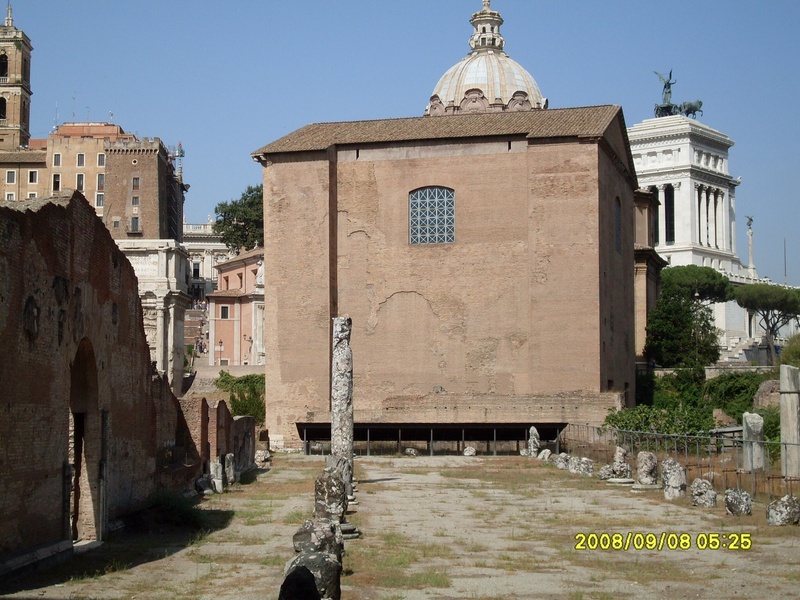 After all, the Curia was the formal seat of government for the Roman empire. Julius Caesar, Mark Anthony were all familiar with it, and had been within it’s walls. 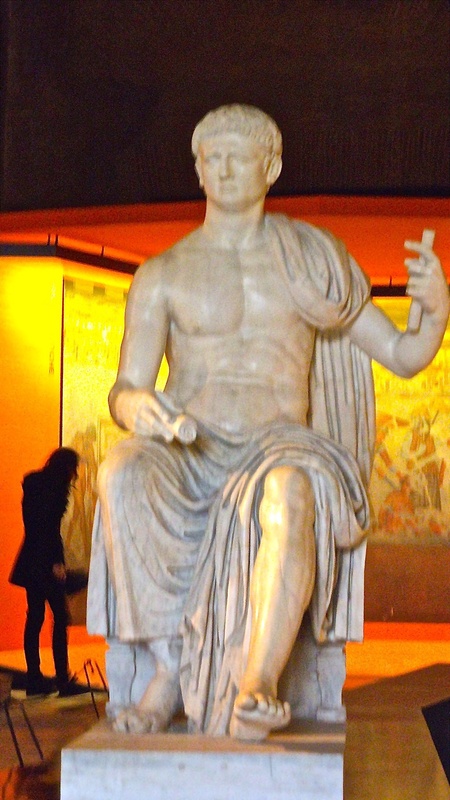 Not being able to see the interior ourselves was a great disappointment for us and particularly Frank, who is very buff on Roman history. Granted, the tour guide did let it be known that up to 90% of the building itself had been heavily renovated. Nevertheless, it’s a good piece of insight to see it for yourself. I’ve learned that it’s very challenging to go sightseeing walking tour during a rainstorm. You tend to keep your head down and look at your feet a lot. Your head and shoulders are covered with an umbrella so you don’t have much of the peripheral vision. It’s unfortunate, but even in the rain, the forum has a certain ambiance. This takes takes me back several decades to when my children were small. We had the good fortune to be able to take them to Disney world several times when they were young. And of course, it’s inevitable that eventually you learn that yes, the rain does fall, even on Walt Disney World. However I was very impressed at how quickly the rain ponchos an umbrella kiosks were set up. Talk about magic, in the Magic Kingdom. I would say that they were all up and running in less than three minutes. And it was most insightful running from Disney pavilion to Disney to pavilion trying to dodge the raindrops and being utterly mystified as to how Mother Nature can actually allow a rain storm at Walt Disney World. After all, I never once saw a brochure of Cinderella’s castle being battered by rain. And the same goes for Rome. And so, there was an ongoing curiosity about what the interior of the Curia really looked like. Did it still have the benches that the orators spoke from? Were there Disney-like replicas of the senators arguing the merits of Roman law? Frank and I were determined to find out. As we entered the forum grounds, Frank mentioned his interest in the Curia to our tour guide. 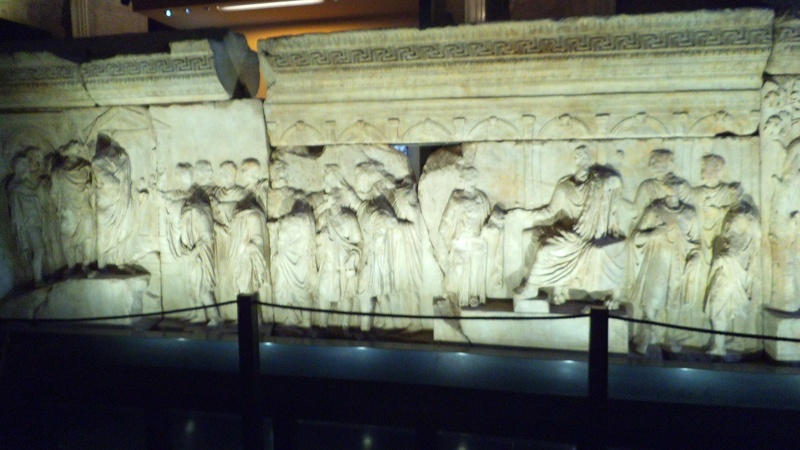 The tour guide replied that that the Curia was not one of the points of interest featured on the tour. Frank said nothing more as the rain continued to drizzle down. My thoughts were turning back to a warm bed and dry feet as I kept trudging forward through the Roman mud. Suddenly, we were at the base of a staircase and being led into a building. Curious, I lowered my umbrella to look and see exactly what building we were entering. The moment that I stepped over the threshold, it finally dawned upon me where we were. Thank you Mr. Tour Guide! However, looking around, upon this realization, I underwent a culture shock of sorts. I had imagined the interior of the Curia either as a work in progress construction site, or a replica of what it actually looked like back in Caesar’s era. Instead, what I was looking at was a tres chic Art Deco featuring the modern day art of Ancient Roman times with ambient lighting any interior decorator would die for. A couple of tables, chairs and mood lamps and a bar and you’ve got a gathering place the likes which has never been seen before. Certainly, this was better than anything I’ve seen back at home.